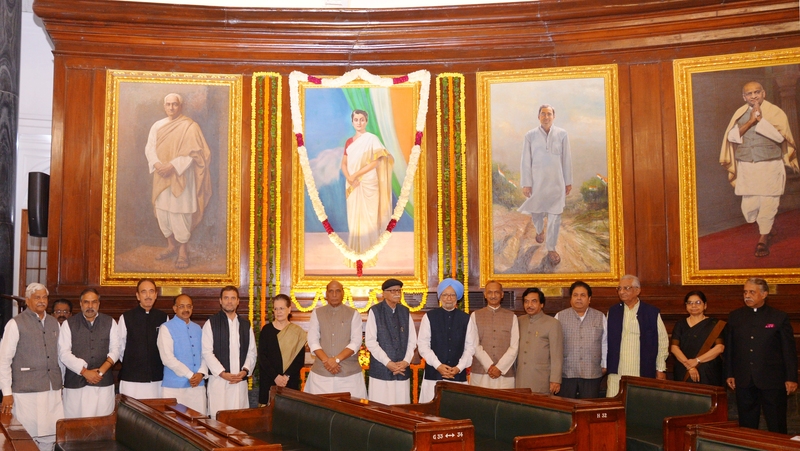 Union Minister of Home Affairs Shri Raj Nath Singh; Former Prime Minister Dr. Manmohan Singh; Leader of Opposition in Rajya Sabha Shri Ghulam Nabi Azad; Minister of State for Parliamentary Affairs and Statistics and Programme Implementation Shri Vijay Goel; Former Deputy Prime Minister and Chairperson, Ethics Committee (Lok Sabha), Shri L. K. Advani; Chairperson, Departmentally Related Parliamentary Standing Committee on Human Resource Development (Rajya Sabha) Dr. Satyanarayan Jatiya; Chairperson of the Indian National Congress Party and Member of Parliament (Lok Sabha) Shri Rahul Gandhi; Smt. Sonia Gandhi, Member of Parliament (Lok Sabha) and other dignitaries after paying floral tributes to Smt. Indira Gandhi in the Central Hall of Parliament House on her birth anniversary, on 19 November 2018.